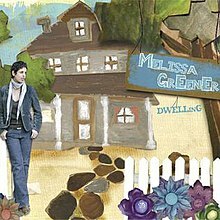 Dwelling is the second album by American singer-songwriter Melissa Greener; it was released on 12 January 2010. The album was produced by John Jennings who has produced several albums for Mary Chapin Carpenter. It was recorded and mixed by Jennings at Red Hill in Charlottesville, Virginia. The album cover's photography and art was by Traci Goudie. One of the tracks on the album, "Bullets to Bite", won first prize in the folk category of the 2009 USA Songwriting Competition. Greener performed "Bullets to Bite" in episode 13 in series 1 of the television documentary Troubadour, TX, first aired on 10 February 2012. ^ Storror, Ian (7 January 2014). "Melissa Greener (USA)". Folk Roots List. Retrieved 30 June 2014. ^ Cianci, Bob (Nov–Dec 1998). "John Jennings I Belong To You (Vanguard)". No Depression. Archived from the original on 22 January 2010. Retrieved 30 June 2014. ^ "Melissa Greener: Dwelling". AllMusic. Retrieved 2 August 2016. ^ "Nashville Songwriter Series @ the MAC". McConnell Arts Center, Worthington, Ohio. 4 April 2011. Archived from the original on 2 July 2014. Retrieved 30 June 2014.